I just did a power read through of this book in order to pass it on to a friend before spring break. Wow. It is right on with what our tech department is saying and so important for parents and educators to read! Kids are doing what they’ve always done, technology just makes it look different, BUT technology does afford new possibilities, so some things may actually be different. Adults need to be engaged in social media with kids, but not always/everywhere and not as stalkers/surveillance, and kids need more geographic freedom and free time. Social networks online mirror social networks in real life, which are generally drawn along racial and socioeconomic lines, but even moreso. If an independent school is truly interested in increasing the socioeconomic diversity of its student body, it’s going to have to engage in the conversations with students about social media, because that will play a huge part in whether new students can navigate, adapt, and feel accepted in the new school while still preserving their identity in their non school community. 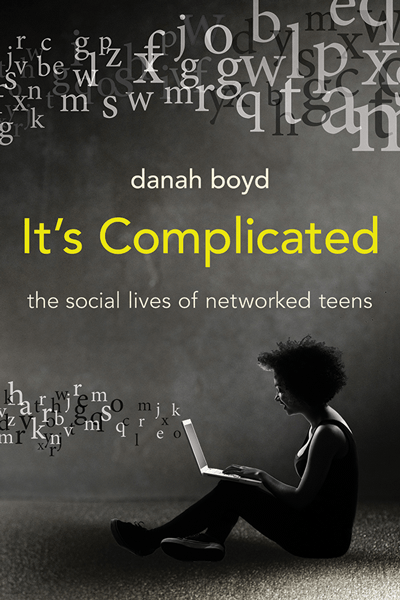 p.30 “The ability to understand how context, audience, and identity intersect is one of the central challenges people face in learning how to navigate social media. —> This is important for adults as well as we begin to have social media footprints that could impact our job if contexts collapse. —> We (teachers/parents) NEED to be in this conversation with them. —> OES social media policy – if the school is perceived as trying to exert power over faculty and staff’s personal life, it will be received negatively. Just as with kids, we need to educate and explain about collapsed contexts and the persistence and searchability of digital tracks. p. 61 Public by default, private through effort. Basically, kids don’t think about intentionally making their conversations private. They just have them, and they are public, but then they are careful about having private ones private. p.180 “We live technologically mediated world. Being comfortable using technology is increasingly important for everyday activities: obtaining a well-paying job, managing medical care, engaging with government. Rather than assuming that youth have a innate technical skills, parents, educators, and policymakers must collectively work to support those who come from different backgrounds. Educators have an important role to play helping youth navigate networked publics and the information rich environment that the Internet supports. Familiarity with the latest gadgets or services is often less important than possessing the critical knowledge to engage productively with networked situations, including the ability to control how personal information flows and how to look for and interpret accessible information.